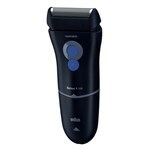 Braun Smart Control 130s-1 Sha..
Braun 130s Mens Single Blade F.. Product weight is 0.83 lbs. It has a built in ultra thin foil for a more comfortable close shave with less irritation. The Braun 130s is designed for dry use with pop-up trimmer that perfect for sideburns and moustache. It offers you with energy efficient smartplug and is easy to clean under running water. Braun 130s Features: Men's Single Blade Foil Shaver, Slim Precision Head - Shaves Close in Hard-to-Reach Areas, Ultra Thin Foil System, Long Hair Trimmer, For Dry Use, Energy-Efficient Smartplug, Washable, Corded Operation, Worldwide Voltage Adjustment - 100V To 240V AC"